5.0 (based on 1 rating) Thanks for your rating! Product #33507 | SKU ILCE7M2/B | 5.0 (based on 1 rating) Thanks for your rating! Sony has taken their line of full-frame cameras to the next level with the Alpha a7 II Mirrorless Digital Camera , which features 5-axis SteadyShot INSIDE image stabilisation with 4.5 stops of compensation for pitch, yaw, horizontal shift, vertical shift, and roll. Operation of the 24.3-megapixel series has been streamlined with a redesigned grip, shutter release button, and customisable controls. The a7 II also features a moisture- and dust-resistant design with a magnesium alloy body and a more robust lens mount. And, with refined algorithms and better utilisation of the BIONZ X image processor, the a7 II has an enhanced Fast Hybrid AF system that is about 30% faster than the previous model along with a 5 fps burst rate with continuous autofocus as well as a 40% faster start time. In addition to highly detailed stills with smooth gradations, the a7 II now has access to the high-bit-rate XAVC S format with 60p, 30p, and 24p recording options, all at 50 Mbps. The look of movies can also be adjusted with picture profiles, including the addition of the S-Log2 gamma setting with a dynamic range approximately 1,300% of the standard sRGB spectrum. Timecode and user bit settings are available as well as clean HDMI output for a variety of recording options. The advanced Sony Multi-Interface Shoe expands compatibility options for flash, microphone, and other accessories and, as an E-mount full-frame camera, the a7 II is compatible with all present APS-C E-mount lenses in APS-C crop mode as well as new E-mount full-frame Zeiss and Sony G-series lenses. Lens mount adapters with a tripod mount are also available to use A-mount lenses on E-mount cameras, and an optional dedicated battery grip enables stable extended shooting and vertical orientation stability. Rounding out the a7 II's imaging capabilities, both a 3.0" 1,228.8k-dot tilting LCD monitor and 2.36 million-dot OLED electronic viewfinder are available for image monitoring and review. Built-in Wi-Fi connectivity, with support for NFC, is available, too, for instant sharing of imagery from the camera as well as remote camera control from a linked mobile device. 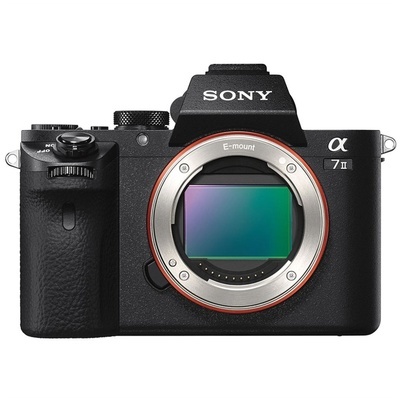 Incorporated into the a7 II's redesigned body are a 24.3-megapixel Exmor CMOS image sensor and BIONZ X image processor, which work together to enable a wide dynamic range with minimal noise and rich, subtle gradations. The camera features an ISO range of 100-51,200 which can be expanded down to ISO 50. Also, this combination allows the a7 II to reproduce details with excellent clarity. Further improved in this generation is metering performance, which is now possible down to a rated -1 EV. Also, the a7 II will start up approximately 40% faster than the previous generation for almost instant on. Packed into the svelte a7 II is a remarkable 5-axis SteadyShot INSIDE image stabilisation system. This compensates for five types of camera shake encountered during handheld shooting of still images and video. This allows users to confidently use any lens, even adapted lenses, for critical imaging without encountering blur from camera shake. This system will compensate for approximately 4.5 stops of shutter speed for working with a huge variety of subjects. For long focal lengths, the system will correct for pitch and yaw adjustments. Macro and high magnification imagery on the other hand will benefit from the inclusion of horizontal and vertical shift compensation. And, all shooting styles will get usage out of the roll compensation. All 5 axes of stabilisation will function at all times, even when used with third-party lenses and adapters or lenses with built-in optical stabilisation. When using lenses that do not transmit imaging data to the camera, manual settings can be used to input the correct focal length and ensure proper stabilisation. Also, the viewfinder can be used to preview the amount of compensation by pressing the shutter release button halfway or magnifying the image. Utilising 117 phase-detection and 25 contrast-detection autofocus points with a wide area of coverage, the a7 II can smoothly and quickly track fast-moving subjects throughout the frame. It optimises for both speed and accuracy with an enhanced algorithm that improves performance by about 30% when compared to previous generations. This just developed algorithm will also more accurately predict subject movement for tracking that is 1.5x more accurate. Additionally, it can capture images at a rate of 5 fps while using continuous autofocus and automatic exposure. This can be captured in a burst of up to 77 frames when shooting in JPEG Fine L format and a continuous AF Display allows users to view the active AF points. Another feature available with this AF system is a Lock-on AF tracking that will analyse more information from the scene to provide dramatically improved accuracy and stability. Eye AF is also available which will prioritise a subject's pupil for excellent portraits even with a shallow depth of field. Shoot full HD 1920 x 1080 video at frame rates of 60p, 30p, and 24p with the high-bit-rate 50Mbps XAVC S format. This results in excellent image quality with minimal noise and artefacts without requiring a large amount of disk space. Additionally, the system using linear PCM sound for high quality audio. When recording internally, users will record video with a 4:2:0 sampling at 8-bit, however, to even further improve image quality the a7 II has clean HDMI output for use with an external recorder. This allows users to capture 4:2:2 uncompressed video and save in an edit-ready format. The a7 II has multiple timecode recording options to meet different workflows. It has the standard 'Record Run" mode that only advances the timecode when recording, as well as "Free Run" timecode that advances the timecode even when not recording, which can be great for syncing multiple cameras at live events. It can also record timecode in both drop frame and non-drop frame modes. When recording internally the a7 II is also able to output timecode via HDMI. To make sure the a7 II is able to use its extensive dynamic range while recording video it incorporates extensive customisable colour and gamma controls. Users can adjust the gamma, black level, knee, colour level, and more. Also users can use the same S-Log2 Gamma Curve that is found on high end Sony Cinema cameras that squeezes up to 1300% more dynamic range into the video signal then traditional REC709, for increased post-production flexibility. With a larger, more refined shape to the grip, users will find the a7 II to have a more secure feel and grasp even when large lenses are mounted. Also, the shutter release button has been reshaped and moved forward for a more natural shooting position and a decrease in camera shake. The controls also have been refined with new position for easier handling and improved operation. Button customisation is available with the ability to assign any of 56 functions to any of the 10 customisable buttons for a more personalised setup. The compact form is well-built with a magnesium alloy top cover, front cover, and internal structure. The lens mount has been redesigned with a greater strength and rigidity for extra security when using larger or longer lenses. The body itself also features greater sealing for dust and moisture resistance, providing more protection when shooting out in the elements. Additionally, the optical filter on the sensor has an anti-static coating and there is an anti-dust mechanism to prevent dust from adhering to the sensor. The a7 II features a 3.5mm microphone input jack for compatibility with external microphones. And for users needing more the a7 II is also compatible with the Sony XLR-K2M XLR Adapter for recording professional balanced XLR audio signals with phantom power and adjustable mic/line inputs. For monitoring audio the a7 II features a 3.5mm headphone jack as well as real time audio levels for a visual reference. Built-in Wi-Fi connectivity enables the a7 II to instantly share imagery to mobile devices for direct sharing online to social networking, via email, and to cloud storage sites. NFC (Near Field Communication) is also supported, which allows for one-touch connection between the camera and compatible mobile devices; no complex set-up is required. Once connected, the linked mobile device can also display a live view image on its screen and remotely control the camera's shutter. Additionally, PlayMemories Camera Apps are also supported via the built-in Wi-Fi connection, and allow you to personalise the camera's features depending on specific shooting styles. Apps are available to suit creating portraits, detailed close-ups, sports, time lapse, motion shot, and other specific types of imagery. Picture Effect modes: Posterization (Colour, B&W), Pop Colour, Retro Photo, Partial Colour (R/G/B/Y), High Contrast Monochrome, Toy Camera, Soft High-Key, Soft Focus, HDR Painting, Rich-Tone Monochrome, Miniature, Watercolour, and Illustration. Colour space: sRGB standard (with sYCC gamut) and Adobe RGB standard compatible with TRILUMINOS Colour. Picture Profile parameters: Black Level, Gamma (Movie, Still, Cine 1-4, ITU709, ITU709 [800%], S-Log2), Black Gamma, Knee, Colour Mode, Colour Level, Colour Phase, Colour Depth, Detail, Copy, and Reset. Face Detection is available to base exposure and focus on up to eight recognised faces. Furthermore, Eye AF can be used for even greater precision by maintaining critical focus on a subject's eye.